While full-time firefighters are manning picket lines, most part-time or retained firefighters are still on call. BBC News Online joined them in rural Lincolnshire. "It is the fun factor, the adrenaline, the buzz - there can't be anything in the world like it." Leading firefighter Neil Johnson is only 33, but he has already spent 16 years in the fire brigade at Wragby in Lincolnshire. His family has fought fires in the community for 104 years. Does firefighting rule his life? "You never leave it, really, we are married to it," Neil says as he sips a cup of tea in the kitchen of his home, which is a full 25 yards away from the fire station. Retained firefighters must live within five minutes of the fire station. 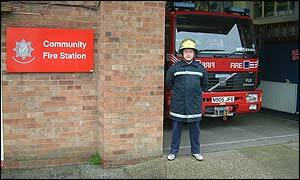 "Day-to-day life for me - it is fire brigade first and my social life second. I know it shouldn't be. The average Joe Public just wouldn't do it. "You can't go to the pub for a drink, because you are on call, so your social life dies when you join." Neil has another job as well - also with the Lincolnshire Fire Service - working with disadvantaged youth in a speciall training scheme. Wayne Porter, 41, who works as a retained firefighter 12 miles away at Lincoln, agrees. "I've been working for 16 years, but I still get a buzz from it now. "It is a very strange breed of people who get up at 3am on a freezing morning to spend a whole night fighting a fire, " he said. "We can do anything from rescuing a person collapsed in the bath to a major rail accident - whatever comes in - we go out to. "At the scene of a fire, we do everything an all-time firefighter does - same risks, same everything. "We are on pagers so when we get a call, we drop everything - basically our pagers are strapped to us all the time. His colleague Roy Proctor, 49, a leading firefighter says: "There is no problem responding to a call, we are up and out in a hurry. "But you might have a problem getting back to sleep after a big incident at 3am." Lincolnshire has 530 retained and about 125 full-time fighters. London and other metropolitan areas - with a response time of 4 or 5 minutes - have no retained firefighters. He is always ready to respond to a 'shout', and is quite happy with his union's no-strike clause. "I know I couldn't be on strike and know that Granny Smith down the road, because I had not gone out, had died, I just couldn't handle it." His life is dominated by the fire station across the road, but he loves every minute. "You're always on the move, always doing something, there is nothing like it. "I pull dead bodies out of cars, but it doesn't bother me, I guess I am a bit of a hard-faced git," he adds. In last few weeks, the firefighters in Wragby have responded to five road accidents in which five people died. If there is another incident in the next few days, the odds are that Neil Johnson will be there. He knows that someone else's life may depend on it.